I first heard the “Aisle 6” joke while interviewing a grocery industry veteran: “Take a grocery store executive, blindfold him, and place him in Aisle 6 of any grocery store anywhere in the country,” said the consultant. “Ask him to guess what chain he is in.” Chances are, he can’t. The “punchline” is left unsaid, because grocery insiders intuitively know the problem: nearly every grocery store’s Aisle 6 looks exactly the same. Consider the “center store,” the long aisle after aisle of “Aisle 6s,” stocked mostly with packaged goods. 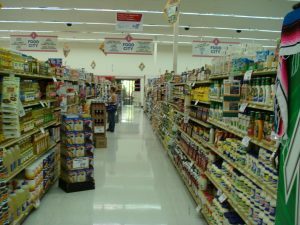 These are the aisles that make the grocery shopping experience such a loathsome chore for so many people, and a crisis for supermarket executives and grocery story owners. As a cultural anthropologist who studies the supermarket industry through an ethnographic lens, I watch recent trends shaping the center store landscape. And as someone who works for a retail strategy and design firm—my “day job”—I work closely with top executive teams to understand their shoppers and consumers, the world of food, and the store experience, in order to help create prototype retail spaces. As both observer and expert, I can see some curious discrepancies between the internal struggles of a unique and complex industry and the criticisms and projections of public audiences outside the industry. 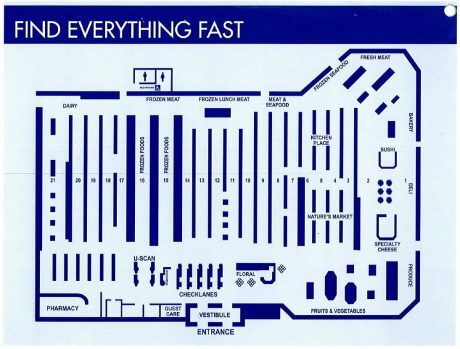 Rule #12: Shop the peripheries of the supermarket and stay out of the middle. Most supermarkets are laid out the same way: Processed food products dominate the center aisles of the store, while the cases of mostly fresh food—produce, meat and fish, dairy—line the walls. 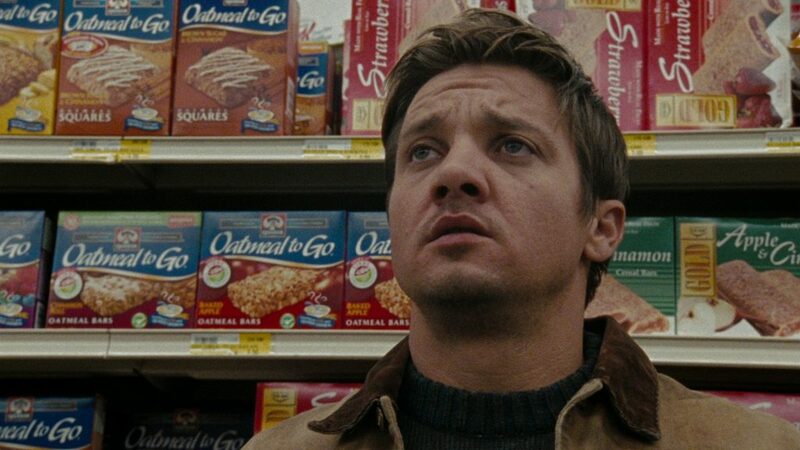 If you keep to the edges of the store you’ll be much more likely to wind up with real food in your shopping cart. This strategy is not foolproof, however, since things like high fructose corn syrup have crept into the dairy case under the cover of flavored yogurts and the like (Pollan 2009:27). Pollan is not alone in this critique, but there is another critical voice focused on the center store: the industry itself. From the industry’s perspective, something is not quite right with the center store, but the problem is not health, the obesity epidemic, or where our food comes from, nor a conspiratorial story of how major corporations collude to manipulate the American stomach. It is a story about the slow-paced evolution of a $600 billion food retail industry, with 3.4 million employees in America. But if the center store represents a quandary, the industry’s solution cannot be, as Pollan might hope, to simply get rid of it. The center store will be an inevitable component of the industry’s transformation. Back in the Day. 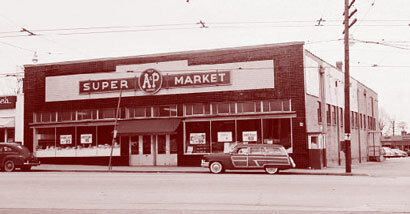 An Early A&P store. In the early twentieth century, American shoppers experienced a very different supermarket. Compared to the 50,000 square feet of average stores today, the first supermarkets measured roughly 5,000 to 10,000 square feet. And while the contemporary supermarket experience typically begins in the produce department today, where grocers seek to invoke a perception of “freshness,” some early supermarkets lacked a produce department altogether. Nor did many of these early supermarkets have a bakery department, meat department, or dairy department. The grocery store was not initially intended to be the only food-shopping destination, but one that supplemented trips to the butcher, the baker, the greengrocer, or the dairy (Mayo 1993). 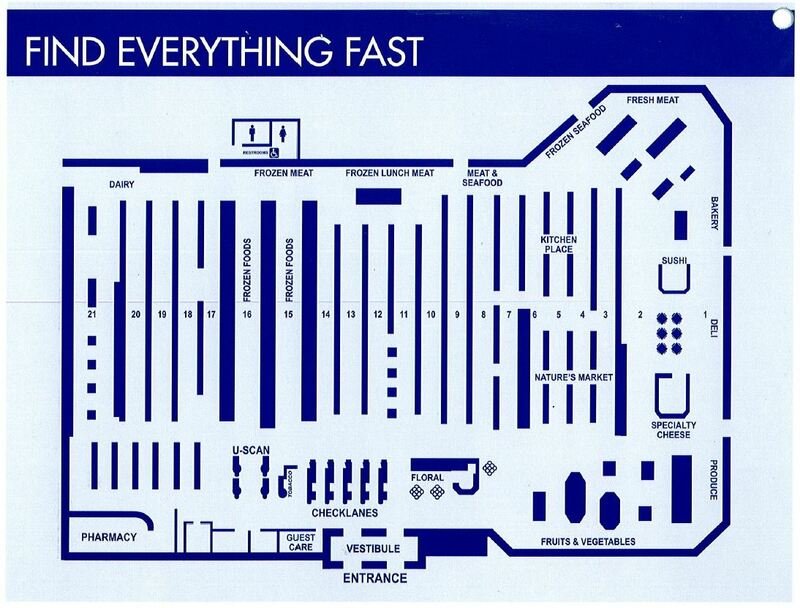 The genesis and thrust of the early supermarket store format was the center store. A handful of aisles stocked with packaged goods, cans, and barrels of shelf-stable staples, center store products made a direct connection to the average American family’s pantry (compare with Cochoy, this issue). Because these early stores did not focus on fresh products, the business model was closely tied to the rise of massive consumer packaged goods (CPG) companies through the course of the twentieth century such as Procter & Gamble and Kellogg’s. The center store was and continues to be a central medium for the CPG industry, which has played a primary role in shaping and influencing its size and form. Over time, separated specialty shops, such as the butcher, were integrated into the supermarket, evolving from minor store amenities into entire departments that populated the “perimeter” of the store experience. This fueled growth throughout the industry, but the center store continued to be the supermarket’s central economic engine. Today, industry insiders argue, the fortunes of the center store have tumbled. As a percentage of overall sales growth for the industry, the center store lags behind perimeter departments, such as prepared foods, produce, bakery, and meat. Why? Competing expert positions on the answer offer a glimpse into the evolution of the center store. A Typical Aisle 6. Or maybe Aisle 5. Recent supermarket studies reveal fewer shoppers pushing carts up and down center store aisles. Shoppers spend less time in center store and make fewer purchasing decisions there, opting to pace quickly rather than linger. Observers, including store-level managers and supermarket employees, note increasing numbers of shoppers pushing their carts along the edges of the center store, pausing at the edge of each aisle to peer down. Without much to pique their interest, and amid a cacophony of packages and signs, all screaming out for their attention, more people shop these aisles in a highly tactical manner. VideoMining recommends grocery stores prevent leakage by “improving space navigation” and “navigational assistance,” or, in other words, by altering the “planogram” level (the visual schematic maps that guide store teams in placing products on the shelf; these planograms have traditionally been controlled by each category’s best-selling CPG company). For VideoMining, as well as many in the CPG industry, refined planograms are the magical solution that can attract more shoppers into center store. Beyond shelf-level solutions, store chains, consultants, and CPGs are experimenting with the actual context or shape of the center store. Aside from some experimental store layout formats that have mostly failed, most of these innovations focus on a single aisle or category in the center store. For example, one major CPG recently experimented with the cookies and crackers aisle in a small number of midwestern grocery stores. They removed more than a dozen feet of shelving, included a small open refrigerated case with milk, and incorporated a wooden kitchen table merchandised with products, recipe cards, and other evocative objects. Although the project was successful on many levels—increasing shopping time, customer satisfaction, and sales for the entire category—the roll-out of this innovation by the CPG company demonstrated the difficulties of making substantial changes: CPG companies and grocery stores were upset with the loss of product space, stores complained about the operational complexity of stocking milk in the center store, and no one could agree on who would pay for the roll-out. In the end, the experiment ended with a redesign into a wood veneer endcap that was much cheaper to produce and exactly replicated the existing center store aisle configuration. All of these experiments and innovations ultimately focus on the “tactical” rather than the “strategic” level. Reinventing the aisle, revising planograms, and reworking the store’s environmental context all require different operational arrangements, but none of these tactical innovations fundamentally alters the business model of the supermarket. Facing a crisis, these experiments represent an earnest, but likely misguided, hope that no major reevaluation of the grocery store chassis is necessary. CPG revenues continue to rise on an annual basis, but where are shoppers going to get the everyday staples of the American household if not the supermarket center store? The crux of this problem likely has less to do with the flow of shopping behaviors in the center store and more to do with the products and their retailers. Grocery store executives around the country recite the critique by heart; paraphrased, it goes, “A can of corn is a can of corn. Center store is not a place where we can differentiate our business.” Shoppers care about where a cucumber came from and the qualities of how it smells, feels, looks, and tastes. But the qualities of center store products have been engineered to create a degree of consistency and reliability indifferent to the retailer. The competitive battle inside the center store is about cost and price, because the center store is fully commoditized by the shopper. Ironically enough, this is exactly the shopping behavior grocery stores had earlier encouraged to win over so many shoppers from the “mom and pop” grocers and smaller independent supermarket chains. Although farms, CPGs, wholesalers, and store chains have long viewed food products as commodities to be sold, stored, processed, and shipped, when shoppers purchase them, they are transformed from a price-focused commodity object into a multilayered meaningful object, process, or behavior. This relationship, which Daniel Miller (1998) compares to an act of ritual sacrifice, is at the core of the center store crisis: a crisis of price and quality. Walmart, Costco, WinCo, and other big-box retailers have become “category killers,” strategically grabbing supermarkets’ center store revenues by focusing almost solely on low prices. Walmart began selling groceries only in the mid-1990s, but today they enjoy the largest market share of grocery sales in the United States. They accomplished this remarkable rise by focusing on an “Everyday Low Price” (EDLP) strategy, which has been especially effective in traditional center store categories. Walmart and others own what people in the industry call a “price perception” reputation: shoppers believe Walmart products cost less than the grocery store, even when this is not always the case. Most grocery store industry veterans I have spoken with find Walmart’s price perception infuriating. Having grown up in an era when their stores won the price perception battles, these veterans have relented the battle against Walmart only in the past decade. Even if they can beat Walmart on price, they now know they cannot win the perception campaign. Conversely, a different approach to the center store is summed up in optimistic articles like this one from Supermarket News: “Survey: Consumers Value Quality Over Low Prices” (2012). For grocery store executives, quality is the way to beat their low-price competitors. Grocery insiders generally agree that while price-focused competitors such as Walmart win on price perception, they lose at quality perception: shoppers simply don’t believe the quality of the Walmart perimeter departments is as good as those at the supermarket. The focus on quality leads to a different strategy—a holy grail, of sorts, that only a few darlings of the industry have attained—to provide a whole-store experience that decisively “wins” on quality perception, without losing the center store price war. In this respect, no traditional grocery store brand is more revered inside the industry than Wegmans, a relatively small but highly profitable chain with more than 80 stores throughout the mid-Atlantic region (see, for example, Gallagher 2013). Wegmans departs from a conventional grocery store format with an additional avenue on one side of the store to combine the best of the traditional grocery store with the indulgent offerings of more specialized gourmet food retailers. But Wegmans’ success is not only due to increased revenues in their gourmet avenue: having built a quality reputation in perimeter departments, Wegmans has used its reputation equity to build a “private label” brand that reinvigorates the center store. A typical private label brand. Private label, or “generic,” center store products have long had a bad reputation. In the past, they often looked like government-issue food rations, more suitable for nuclear fallout shelters and homeless encampments than the dinner table. Wegmans and others figured out how to dramatically elevate the quality of private label products and, by pivoting off price points set by national CPG competitors, sell products of comparable quality for lower prices. Industry trade magazines and even national media point to the “Great Recession” of the late 2000s as a key moment in the evolution of private labels, as shoppers were more willing to downgrade product brands before downgrading shopping destination brands (Martin 2008). They would rather choose the Wegmans private label brand over national competitors than shop elsewhere. Wegmans’ private label share today is around 25 percent in the center store (Hofbauer 2013), while most in the industry average around 15 percent (Angrisani 2008). At the same time, Wegmans keeps pounding on a price perception campaign. But instead of touting themselves as having the lowest prices around, their message is fairness. Several years ago, Wegmans president Danny Wegman created a series of commercials and videos about fair and consistent prices that explained the store’s pricing strategy with charts and graphs to shoppers (Shope 2002). More recently, Wegmans has received media attention for a series of “price freezes” on everyday staple products in the center store that are applicable only to Wegmans private label products (Freeman 2013). 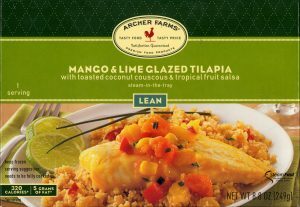 Some alternative-format grocery stores, such as Trader Joe’s, have unreservedly invested in the private label strategy. Trader Joe’s stores carry just a fraction of the number of products that a regular grocery store does, and more than 90 percent of those products are private label. If there is one ketchup, it’s going to be Trader Joe’s ketchup: national CPG brands, like Heinz, are left out of the mix. In doing so, the brand’s strategy is essentially focused on a kind of metacritique of the traditional supermarket center store and the CPG industry that played such a key role in its development. The mass acceptance of private label speaks to the increasing numbers of shoppers who are nominally aware of the critique. In the end, the material realities of store size, store format, chain size, long-term supplier relationships, and established business models make the center store crisis an enduring one: it’s not going away anytime soon. But we might nonetheless imagine a near-future scenario where discerning “real food” from “processed food,” as per Michael Pollan’s critique, is no longer a simple task. In or out of the center store, new critical shopping strategies may be required. Alaimo, Dan. 2013. “Fine-Tune Frozen Layouts for Big Sales Increases.” Supermarket News December 19. Available at link. Angrisani, Carol. “Private Label: Behind The Report.” Supermarket News January 28. Available at link. Freeman, Chris. 2013. “Wegmans Extends Private Label Price Freeze.” Private Label Buyer January 3. Available at link. Gallagher, Julie. “Wegmans Tops D.C.-Area Stores in Price, Quality.” Supermarket News November 4. Available at link. Hofbauer, Randy. 2013. “Wegmans: A Celebration Of Food.” Private Label Store Brands January 1. Available at link. Martin, Andrew. 2008. “Store Brands Lift Grocers In Troubled Times.” New York Times December 12. Available at link. Mayo, James M. 1993. The American Grocery Store: The Business Evolution of an Architectural Space. Westport, CT: Greenwood Press. Miller, Daniel. 1998. A Theory of Shopping. Ithaca, NY: Cornell University Press. Pollan, Michael. 2009. Food Rules: An Eater’s Manual. New York: Penguin Books. Supermarket News. 2012. “Survey: Consumers Value Quality Over Low Prices.” Supermarket News September 28. Available at link. Shope, Dan. 2002. “Wegmans President Stars In Video.” The Morning Call (Lehigh Valley) April 2. Available at link.